Carmageddon—it was the nightmare scenario L.A.'s transportation authorities warned of when a construction project shut down a critical stretch of freeway for an entire weekend in July 2011. Gridlock. The glow of brake lights. The overwhelming angst of a city denied its full and unimpeded access to its freeways. In the end, the public outreach built around that ominous term worked. Motorists stayed home, and life went on as normal. A few wags even staged a "dinner party" on the deserted freeway. But it's possible that all the dire warnings and clever pranks obscured a more troubling possibility: that Carmageddon had already come to pass decades ago, in the 1940s, '50s, and '60s, when Los Angeles scarred its landscapes, split its communities, and displaced a quarter-million people to build its 527-mile freeway system. In the Santa Monica Mountains—a low but rugged range that divides the San Fernando Valley from the rest of Los Angeles—highway engineers essentially tore Sepulveda Canyon apart and then rebuilt it to allow the San Diego Freeway (I-405, or "the 405" to Angelenos) to pass through. Beginning in August 1960, earthmovers carved a gorge 1,800 feet wide and 260 feet deep through the mountains, accomplishing in two years what might take natural erosional forces two million. The bulldozers' total haul: 13 million cubic yards of slate, shale, and dirt. Workers then built massive retaining walls to keep the unnaturally steep slopes from slipping and reconfigured the area's natural drainage through a series of culverts. By 1962, an eight-lane concrete freeway with a maximum grade of 5½% sliced through the mountains. In mostly uninhabited Sepulveda Canyon, only the mountains could complain. But many Southland freeways bludgeoned their way through heavily urbanized areas, inflicting the same degree of trauma not to landscapes but to communities. No area was more affected than L.A.'s Eastside, where transportation planners routed seven freeways directly through residential communities. Starting in 1948, bulldozers cleared wide urban gashes through the multiethnic but mostly Latino neighborhoods of Boyle Heights, Lincoln Heights, and East L.A., demolishing thousands of buildings and evicting homeowners from their property. And the freeways didn't just displace people and businesses. They balkanized the community, making strangers out of neighbors and discouraging urban cohesion. A freeway can be an intimidating thing to cross on foot. Residents did fight back, flooding public meetings and picketing construction sites. 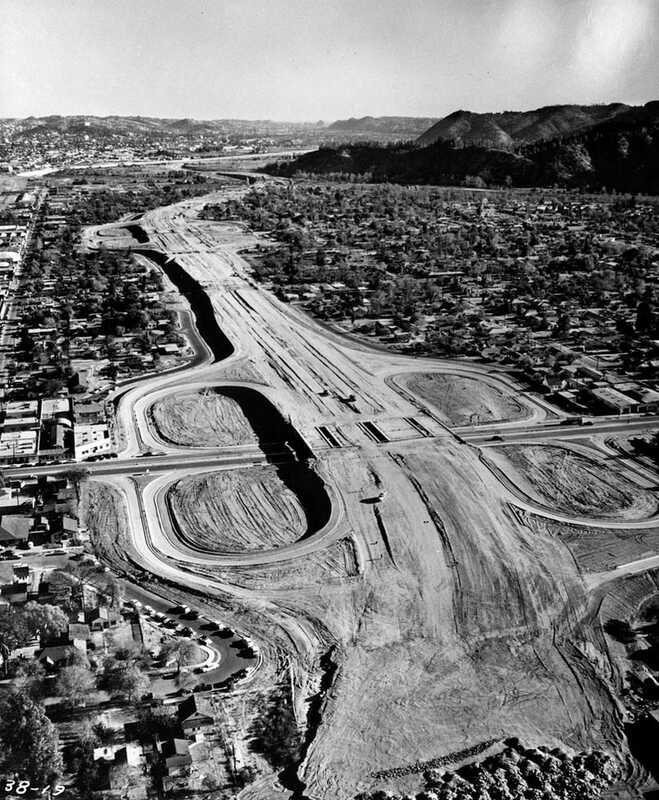 But unlike the mostly white and politically powerful neighborhoods that killed plans for a Beverly Hills Freeway, L.A.'s Eastside couldn't stop the bulldozer. By the early 1960s, all seven of the planners' freeways crisscrossed the community. Five of them tangled together at the East Los Angeles Interchange. Built to provide northbound motorists with a bypass around central Los Angeles, this imposing (and for drivers, often confusing) complex of 30 bridges occupies 135 acres of land—including part of once-idyllic Hollenbeck Park. At the time of its completion in 1961, it was the largest single project ever undertaken by the state's division of highways. Yet somehow, despite its grand scale and enormous cost, the interchange—like much of the freeway system—is often paralyzed today with traffic, as a procession of trucks and automobiles crawls along the old urban scars. Southland is made possible by a partnership between Gizmodo, the USC Libraries, and the member collections of L.A. as Subject. Written by Nathan Masters, the series explores the urban past of Los Angeles, including the lost landscapes and forgotten infrastructures that continue to influence the city we know today. This post previously appeared in a different version on KCET.org as "Before the 'Carmageddon': A Photographic Look at the Construction of 5 SoCal Freeways."